Welcome to spring! Well, meteorological spring that is, which began on March 1st. 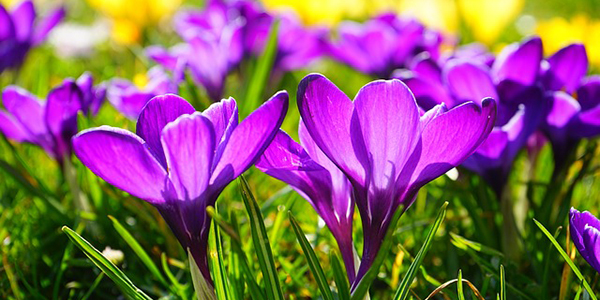 Of course, astronomical spring won’t begin until March 20th and seasonal lag will prevent real spring from showing up until late March and into April. But there are still signs of the changing seasons which many of you have probably noticed… beyond the time change last weekend. Let’s start with the astronomical aspect of the changes. For one, the length of day begins increasing right after the winter solstice in December, which is defined as the shortest day of the year. 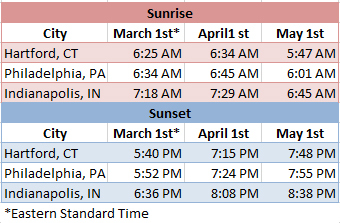 However, it takes time for the increasing daylight to become noticeable, which is usually around February when the sun sets comfortably after 5 PM for much of the Northeast and in the Midwest. February 21st roughly marks the point when a quarter of our full day length (in relation to summer solstice) is regained. Right around March 5th is then another milestone when the days become considerably longer by 2-3 minutes each day. With the equinox approaching on March 20th, we will reach the point that not only signifies half of our full day length is regained, but also the coldest third of the year is behind us. In addition, the sun angle is dramatically increasing and has been since the winter solstice. For instance, as of this week, the sun angle in New York City and Chicago is now around 45 – 46 degrees above the horizon, which is actually equivalent to the last day of September! For reference, the sun’s angle bottoms out at 24 – 25 degrees around winter solstice, so the angle has nearly doubled since then. And of course, around solar noon, you can certainly feel the warmth of the sun a lot more on a clear day even with cooler temperatures. On top of that, it is undoubtedly more noticeable how pavements struggle to accumulate snow during the day, absent of very heavy snowfall. With the sun angle now rising by 0.5-1 degree each day, it’s certainly a notable change. On the meteorological side of things, the changes are slightly less noticeable due to the aforementioned seasonal lag, but this week actually will flip the script as some parts of the Northeast and Midwest are anticipated to see 50-60+ degree temperatures. The reason seasonal lag is a feature of our yearly climate cycle is because it takes time for the northern hemisphere to cool down and warm up depending on the time of year. Even though the entire northern hemisphere has minimal daylight in late December, winter’s full effects are not felt until January and February. This is why meteorological winter is defined as DJF (December, January, February), with January being the climatological coldest month. With that said, we are now on the upswing of things and the frequency of mild days will only continue to increase. 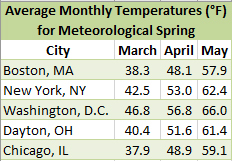 To give an idea of the incremental changes we are witnessing, Boston’s normal highs for the whole of March are now around 45 degrees which is a 10 degree jump from January’s normal. It jumps another 5 degrees by the time April rolls around. That of course has coastal influence so if we switch gears and look at Indianapolis in the Midwest, the average high is now near 52 degrees which leaps more significantly by 15 degrees from January’s average! This takes another significant bump by April when normal high temperatures hit 63 degrees. Looking ahead, after this week’s warm up, we’ll be watching for another cool down next week. However after next week, temperatures will likely make a marked rebound, especially once we enter of the heart of meteorological spring in April.